Heatshield designs for Apollo originated in the re-entry vehicles that were developed in the 1950s for nuclear warheads. 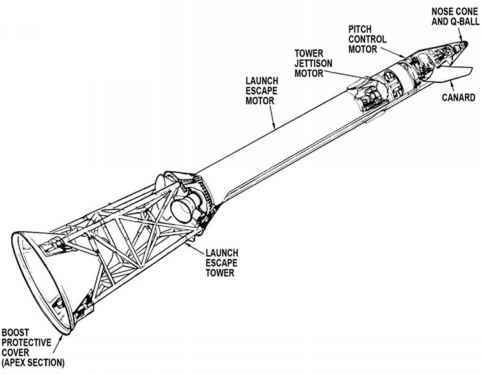 These weapons were launched on ballistic arcs out into space by large rockets to increase their speed and minimise delivery times, but as their elaborate mechanisms had to negotiate the great temperatures generated by reentry, they were protected inside a vehicle whose outer wall included some form of heatshield. Initially heat sinks were used, but development of this Cold War technology led to the use of ablative materials for warheads and this technique was used for many spacecraft heatshield designs, including Apollo, until the introduction of advanced ceramics such as those used in the Space Shuttle and the planetary probes of the 1990s and beyond. The ablative heatshield works by allowing itself to succumb to the enormous heat of re-entry. As it does so, it slowly chars and peels away, or ablates from the body of the shield, taking heat with it and revealing a fresh surface to repeat the ablative process. As long as the thickness of the shield is greater than the depth of erosion caused by re-entry, the heatshield will function properly. The command module heatshield was made from shaped sections of steel honeycomb sandwich, which provided a substructure onto which a fibreglass honeycomb was bonded. There were over a third of a million cells in a complete CM heatshield, and each was carefully filled by hand with an epoxy resin using a specially designed squirt-gun. After curing and inspection, any imperfectly filled cells were carefully drilled out and refilled. The heatshield came in three sections: the thick aft shield took the brunt of re-entry's heat, the centre shield covered most of the CM's conical surface, and the forward shield or apex cover was wrapped around the upper cone of the hull where the parachutes were stored. Each was shaped on large lathes to the correct thickness and rechecked before being affixed around the internal structure of the command module.